At Shearwater, we place a high value in the work being done by the scientific community relating to diving and decompression theory. We do our best to keep on top of what is going on in diving research. 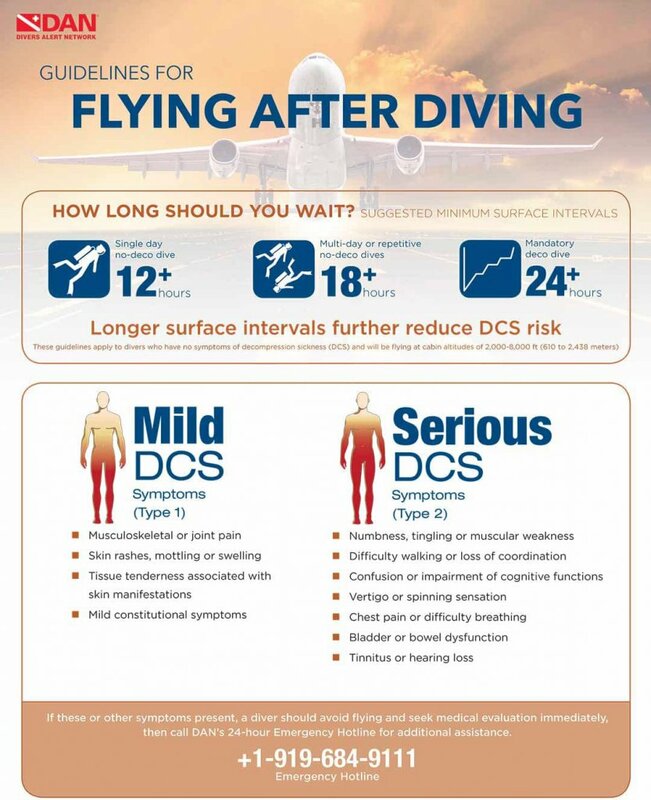 A recent article in Divers Alert Network brings some new data to the discussion of flying after diving. We are often asked why our computers do not display a “Time to Fly.” It’s a good question. Many people think it’s a simple calculation based on the theoretical tissue loading that we have to store to calculate decompression status. * For a single no-decompression dive, a minimum preflight surface interval of 12 hours is suggested. * For dives requiring decompression stops, there is little evidence on which to base a recommendation and a preflight surface interval substantially longer than 18 hours appears prudent. These recommendations aren’t calculations based on the theoretical tissue load. They are based on the type and duration of the diving activity, and a key factor that the computer can’t know – does the diver have symptoms of DCS. We have chosen not to reduce these recommendations to a calculation and we ask our customers to evaluate their situation and use an appropriate preflight surface interval. In the Spring 2015 issue of Alert Diver, Dr. Petar Denoble reviewed some current research and asks whether the recommendations should be reviewed. This research appears to be the first in-flight study of real-life dive exposures. In the article, there were two insights that I found interesting. The first was that in some of the subjects, bubbles were consistently detected on fairly typical recreational dives. The second was that bubbles were detected on some of these same divers during a flight even after waiting 24 hours before flying after multiple days of no-decompression diving. Founder of Shearwater Research Inc. Personal Dive Computers... Thank God! Thanks Shearwater. I read the DAN paper and it looks like good research. What does your deco model predict regarding overpressure relative to the M value (I guess I’m asking for the gradient factor) after approximating the dive and fly profile? I know you’ll have to make quite a few guesses on dive as well as flight profiles but it’d be good to see if the model and the data are trending together. We recommend that divers follow the DAN guidelines. We don’t do any time-to-fly calculations on our products. Actually you could implement this DAN recommendation just as is. Just identify the type of diving done recently and show the appropriate (possibly conservative, explain it in user manual) recommendation like printing, say, “> 24 hours” in case of deco dive. Though I appreciate your position. The problem is that you are asking us to display a number when we don’t know what that number is. There is recent research that suggests that for “bubblers”, the time to fly may need to be longer. I have included a PubMed abstract from recent research than may be of interest to you. Diving Hyperb Med. 2015 Mar;45(1):10-5. Flying after diving: should recommendations be reviewed? In-flight echocardiographic study in bubble-prone and bubble-resistant divers. Cialoni D1, Pieri M2, Balestra C3, Marroni A2. Inert gas accumulated after multiple recreational dives can generate tissue supersaturation and bubble formation when ambient pressure decreases. We hypothesized that this could happen even if divers respected the currently recommended 24-hour pre-flight surface interval (PFSI). We performed transthoracic echocardiography (TTE) on a group of 56 healthy scuba divers (39 male, 17 female) as follows: first echo–during the outgoing flight, no recent dives; second echo–before boarding the return flight, after a multiday diving week in the tropics and a 24-hour PFSI; third echo–during the return flight at 30, 60 and 90 minutes after take-off. TTE was also done after every dive during the week’s diving. Divers were divided into three groups according to their ‘bubble-proneness’: non-bubblers, occasional bubblers and consistent bubblers. During the diving, 23 subjects never developed bubbles, 17 only occasionally and 16 subjects produced bubbles every day and after every dive. Bubbles on the return flight were observed in eight of the 56 divers (all from the ‘bubblers’ group). Two subjects who had the highest bubble scores during the diving were advised not to make the last dive (increasing their PFSI to approximately 36 hours), and did not demonstrate bubbles on the return flight. Even though a 24-hour PFSI is recommended on the basis of clinical trials showing a low risk of decompression sickness (DCS), the presence of venous gas bubbles in-flight in eight of 56 divers leads us to suspect that in real-life situations DCS risk after such a PFSI is not zero. I would interested to hear your thoughts about this particular circumstance: I live in Switzerland at 1200m altitude and intend to do technical diving (40/50m range, OC on air + 1 deco gas) in lake Geneva sitting at 400m altitude, 30 minutes from my home town. How would you deal with “going back home” at a 800m altitude differential with regards to DCS risks? I use a petrel computer and have logged over 200 happy technical dives on it on 30/70 settings. The altitude change you describe falls within the applicability limits for Guidelines proposed by DAN – cabins pressurized to an altitude equivalent to 610 m to 2438 m. Therefore the guidelines would apply to your case. I am Dutch diver on the market for a new Dive computer. I used to be diving with Suunto but for now I am interested in a Teric. The missing link for me is the desaturation timer in this computer. Would it be possible that in de near future that Shearwater brings an update with desat timer? Is it technically possible to implement? For me an important reason to buy a Shearwater Teric or not. Hi, Erwin. The Teric gives you a detailed surface interval clock that can be easily used in conjunction with the DAN guidelines. The surface interval figure can be seen on the home screen of any dive mode in the Teric. Cheers.